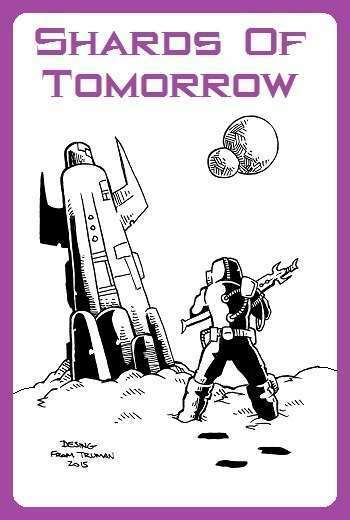 Shards of Tomorrow is my love letter to 1986. It’s an old-school sci fi game jam packed with love for the genre. It’s fast. It’s loose. And it does it all, running a tight set of rules layered over a B/X-inspired classic game engine. When I was thirteen, I spent my afternoons making up starships and imagining worlds that I thought I would never explore. Now I can. Shards of Tomorrow is released under the Open Game License (for the system) and a Creative Commons Share-Alike Attribution License (for the game world). You can create derivative work and publish it. I hope you do! This game is 100% compatible with Saga of the Splintered Realm and Sentinels of Echo City, so you can do that epic sci-fi/superhero/fantasy time travel world-hopping mashup you've always dreamed about. Your purchase of a pdf copy of the game means that you receive a $5 off coupon towards the print edition in POD, which is now available. This link appears at the bottom of the index on page 136. It kept getting put to the back burner... I'll move it to the front burner tomorrow :) It will be up tomorrow night. Hey Mike, As always I am a huge fan of yours so I have got to get this book. I am not seeing the soft cover to buy here, what I do see is you need to buy the PDF then follow the link to get the soft cover? Am I understanding this correctly or can you just buy the soft cover by itself? Thanks in advance. You can purchase the softcover without getting the pdf, but the softcover is $14.95, but the pdf is $4.95 and you get a link for the SC at $9.95... so it's actually 5 cents cheaper to get both. It's available in print from Lulu. I see the softcover edition is out. Will there be a hardcover? I was going to skip the HC on this one, since the HC doesn't seem to be as popular in general as the SC. It's not a big deal for me to set it up, if that's something people want. I will get that going in the next day or two. Thanks, I'll definitely go in for a hardcover (in about a week when I next get paid). It will take me a few days to get that set up, anyway :). Thanks for the support! You caught my attention with "B/X inspired" so I grabbed this to check it out. Looking forward to reading through it. One first impression comment, a pet peeve, is that the PDF doesn't seem to have the cover. Starts with the interior page 1. The purple text cover shown on the product page is not in the file. I'll see if I can change that for the March 1 update. I don't want to do an update every time a small tweak comes up, so I'm keeping a log to do all of the little changes at one time. I'm a fan of your work but this trade-paperback format is a real dog for printing. Any chance of a more usable format (A4 or legal would suit)? Hi. I plan on buying this to print too. A standard letter sized version would be great. Just adding in on the topic. I would even offer to do the page layout and formatting for you for free. I do realize you can set print to "fit to page" and it is usually okay but not optimal for printing. I'm going to be publishing a print edition on March 1, and you get a $5 off coupon to everyone who purchased the pdf, if that helps... be aware that there will be some minor changes in that new file, so it may make some things you printed obsolete. It won't be anything too major, and I'm going to try to put most new things in an appendix. However, I'm also happy to share the original Word doc that I used to create it. Just send an e-mail to mike@mtdaa.com with some proof that you downloaded it and I'll email you an attachment with the Word doc. Hi there. I purchased it based on how much I liked what I read. :D I'll probably pick up the print edition but might take you up on your word file offer as well. EDIT: The "fit to page" option in reader actually isn't that bad for printing it.